After a few months of owning the place, we finally have our first room done at the log cabin! It feels like it has been a long time coming to feel like we reached the point of completion of a project and while it may just be a guest bedroom, it feels dang good. I started with this upstairs guest bedroom because it was the first room that I had a complete vision for [still struggling on the master bedroom big time] and because everything I wanted was on sale thanks to Macy’s Memorial Day Sale [taking place from now through May 28th] where you can take an EXTRA 20% off items with code MEMDAY, it was a no-brainer to dive in and tackle the room right away. I was able to find EVERYTHING, literally everything, for this space and it all tied together perfectly. I couldn’t be more excited about the results! 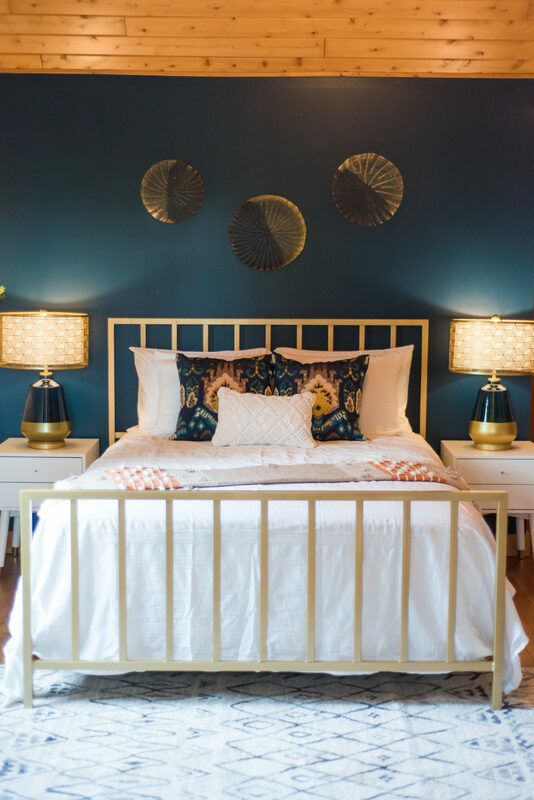 You may remember when we recently redid our master bedroom at our “home” home [aka, the house we live in full-time] and for that project, I turned to Macy’s and because I loved the outcome so much, I figured I’d go that same route again – why mess up a good thing, you know? For this guest bedroom at the log cabin, I wanted to create a modern boho vibe and ultimately create a space that guests would truly enjoy waking up and feeling comfortable in. Before we dive too deep into what the room looks like today, let’s start with where it all began..the before. As you can see, blue was the clear winner on which color to bring into this space as I tucked it away here, there and everywhere. Let’s start with the paint colors in this space – for the back accent wall, I went with Sherwin Williams Moscow Midnight. To keep the rest of the bedroom light and airy, I went with Sherwin Williams Repose Gray at 50% [this simply means it’s half the color which makes it lighter]. I really like how the two colors compliment one another and think that the accent wall gives it just the amount of pizazz that it needed. A room full of masculine and feminine touches. Let’s highlight all of the pieces I snuck in this bedroom, starting with the bed and bedding area. We wanted a queen size bed and I had a vision of gold so when I spotted this gold metallic slat bed for less than $300, I knew I wanted to try it. Fortunately, it turned out perfect in this space. For the nightstands, I wanted to keep them neutral to keep the bed the highlight of the room so when I spotted these with the gold leg detail I was stoked. To polish off the nightstands I went with the most awesome of all awesome lamps, these beauties [spoiler alert, I think they are my favorite thing in the entire room]. For some wall decor, I found these wire baskets and thought to myself “those look like some good baskets to hang on an accent wall” so that’s exactly what we did. To bring a little bit of greenery to the space, I hung these fun mini sedum & sperengeri baskets because I’m all about that fake plant life. Because I love having a little bit of warmth on the floors I added in this 5×7 rug, which finished things off perfectly. I topped off the neutral bedding with a fun pop of blue and gold found in these embroidered pillows and this embroidered little nugget. While on the topic of bedding, I should mention that I purchased this 550 thread count sheet set that is softer than butter. Always remember, guests like butter – lather them in it, baby. I mean, I can’t even with this lamp though. #Slay. Shifting our focus now to the other side of the room, we’ll start with my beloved pouf sitting area. I would have 1,000 poufs if my husband would let me. For some reason, he views those the same as he views pillows. I’ll never understand a man’s disdain for pillows. Now we’ll move over to the desk and bookshelf area. I wanted a little area that people could work if necessary [or you know, a spot where our nieces could watch their toy unboxing YouTube videos..another thing I will never understand ;)]. The desk couldn’t be more perfect for this space and the amount of love I have for the chair I found to pair with it is comparable to the love I have for macaroni and cheese. And you know that’s sayin’ a lot. Last but certainly not least, one of my favorite hangout spots in the room. Each of the guest bedrooms has these fun hideaway spots and they’ve already become quite popular with the nieces and nephews [who am I kidding, with me too]. I simply decked it out with a cute throw, some embroidered comfy pillows and several of those fake candles to give it a cozy vibe. Simply grab a book and come on in! And there you have it! Don’t forget to shop the huge Macy’s Memorial Day Sale with code MEMDAY! If you clicked on any of these links, you already know how great the sale already is [don’t forget to check out all of the clothing items marked down as well!] Now, most importantly – who’s ready to come stay? Be our guest…be our guest…okay yeah, I should be done now 😉 Thanks for stopping by and come back again soon..next up, the kid’s guest bedroom! Stay tuned! Ah, this reminds me of the lake house we used to own in Lake Arrowhead near LA. I loved decorating that house. I would never have thought to use blue as a theme for that room, but man – it looks amazing. Do you ever plan to live here full time? Thanks so much Caren! We plan to use it mainly for work purposes, but will probably spend a lot of time here in the winters. So cozy! !